Posted by sumeethevans on July 28 2010, 2:09 AM. Posted in Messenger. In this release of Windows Live, you can now see your friends’ activity in all the social networks you use. Last week, for example, Douglas Pearce blogged about what this means for the new Messenger. He discussed how Messenger Highlights is designed to be the most complete view of what your friends are doing across the web. Messenger Companion is an exciting extension of that effort. Messenger Companion is a browser plugin which lets you quickly share and discover what your friends have shared online. It lets you view the links your friends are sharing, comment on them, and even share something fun you’ve come across. And if you’ve connected your social networks to Windows Live, Messenger Companion works across all of them. We want to make it easy for you to discover what your friends are sharing online, so if you have your Windows Live ID connected to your social networks, it doesn’t matter where a friend shares information. When you visit a website, Messenger Companion will let you know if your friends have shared any new links on that site by subtly flashing in the top right corner of your browser window. This will open up Messenger Companion and show you all the links recently shared by your friends in any of your connected social networks. Shared links can spark an interesting conversation where friends join in to comment and give their two cents. Messenger Companion shows you the conversation about a shared link, while letting you view the link and comment back. We don’t want you to worry about where the activity is happening, so sharing is seamlessly integrated into your Windows Live experience. When you join in a conversation, your comment gets posted back to the social network your friend used to share the link. The story wouldn’t be complete if there was no way for you to share interesting things you come across online. Not only can you use Messenger Companion to share with your friends, but Messenger Companion provides one-click sharing! Posted by vasudev on February 10 2010, 6:00 PM. Posted in Messenger. The instant messaging category got going in earnest around 1996 with the debut of ICQ, around the same time that Hotmail was founded. Over the next two years, each of what are now the leading IM services launched in rapid succession: AIM, Yahoo! Messenger, QQ, and our own MSN Messenger. Over the following six years, instant messaging services as a category enjoyed explosive, viral growth, ultimately reaching well over half a billion active users sharing hundreds of billions of messages every month. Like every major new communications paradigm over the past 20+ years, the thirst and demand that people have to connect, communicate, and share with one another is nearly limitless. E-mail didn’t disrupt or reduce phone usage – it added to it. IM didn’t disrupt or reduce e-mail – it added to it. The same goes for mobile phones and text messaging, and the same too, for social networking over the past 5 years. Posted by sumeethevans on September 16 2009, 7:52 PM. Posted in Messenger. Posted by sumeethevans on August 29 2009, 3:04 AM. Posted in Messenger, Windows Live. We are committed to providing a safe, secure and positive experience for our more than 300 million customers across the globe using Windows Live Messenger every month. To deliver on that commitment, beginning on August 25, we started asking our customers using versions 8.1, 8.5 and 14.0 to upgrade to the newest version of Messenger. The upgrade will provide customers with the latest software updates including code fixes and feature enhancements, as well address vulnerabilities discussed in the Microsoft Security Advisory 973882 that existed in previous versions of Windows Live Messenger. First Phase, Optional Upgrade: The optional upgrade will happen in two stages: Starting Aug. 25, customers using versions 8.1 or 8.5 were asked to upgrade their client. Starting early Oct., all customers using versions 14.0 (but not the latest release 14.0.8089) will be asked to upgrade their client. The upgrade at this time is optional. Customers who haven’t upgraded during the optional phase will be required to do so during the second phase. Second Phase, Mandatory Upgrade: The mandatory upgrade will happen in three stages: Starting mid-Sept., all customers using Messenger 8.1 or 8.5 will be required to upgrade their version of Windows Live Messenger. Starting late Oct., all customers using Messenger 14.0 will be required to upgrade their version of Windows Live Messenger. To ensure that we are protecting customers, those who do not administer the upgrade will not be able to sign in to Messenger after this time. Please Note: It will take several weeks for the upgrade process to be completed, as the upgrade will be rolled out to customers over the course of several weeks. Below are some examples of the prompts that you will encounter during the upgrade process. Want to upgrade now? You don’t have to wait for the notification. 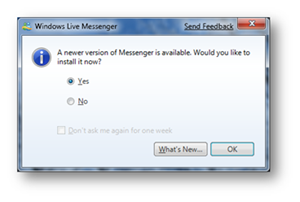 In fact, we encourage you to download the updated version of Messenger right now by visiting http://download.live.com . Posted by sumeethevans on September 3 2008, 11:19 PM. Posted in Messenger. The Microsoft Translator team is excited to announce the new translation bot for Windows Live Messenger! This Messenger bot does translations for you. Just add mtbot@hotmail.com to your contacts and start chatting. You can have one-on-one conversations with the bot, or you can invite a friend and chat in different languages with the bot translating for you. As usual, remember that machine translation isn’t perfect – slang especially will give the engine trouble. You can also access Windows Live Messenger on your smartphone to use the bot to translate simple sentences while you’re traveling to other countries! Posted by bink on July 23 2008, 5:06 PM. Posted in Messenger. It wasn't too long ago that RIM announced an agreement with Microsoft that would bring Windows Live services to BlackBerry handsets later this summer. We were expecting to be made to wait a little longer, but that agreement has already delivered results as Windows Live Messenger became available to BlackBerry users earlier today. The Live Messenger client, available to download from blackberry.com/livemessenger, supports popular features such as group chats, emoticons, display pictures, and even has the ability to send and receive files. Very handy. Users can expect to see plenty more Windows Live services appear on BlackBerry devices throughout the year, but this is a welcome start. Posted by vasudev on June 27 2008, 7:59 AM. Posted in Office, Messenger, Mac. <basefont>Messenger for Mac 7.0.1 is an integrated communications client that enables you to communicate with contacts within and outside your organization. Messenger for Mac 7.0.1 is a Universal application that is built to run on both PowerPC-based and Intel-based Macs and makes it easy to take advantage of the full power of real-time communications.Messenger for Mac 7.0.1 improves support for users of the VoiceOver feature in Mac OS X, and it fixes user interface issues that appear when Messenger is used with some European languages. Posted by sumeethevans on May 13 2008, 9:57 AM. Posted in Messenger. Have you ever wished you could watch the best videos on the web with your friends? With Messenger TV now you can! Relax, laugh, and chat with your friends as you watch your favourite videos together over the internet. It's like your own virtual living room! Checkout the three easy steps below and then start sharing your favourite videos – it's that simple! Sign-in to Windows Live Messenger and start chatting with a friend you would like to watch videos with. Click on the 'Activities' menu button on the toolbar above the chat window. Select 'Messenger TV' to send an invite to your friend. Start sharing loads of great MSN videos! Posted by vasudev on May 12 2008, 12:22 PM. Posted in Messenger. As some of you noticed, we had a problem from Friday night to Saturday morning where our Messenger service was incorrectly blocking some legitimate IP addresses. We sincerely apologize for any difficulties this caused our users. And we want to thank those of you that reported this problem to us so that we could quickly fix it. Because of your help, the incorrect block was only in place for a few hours. As you can imagine, we are very serious about our efforts to block virus, malware and other harmful URLs from being passed on to our users. And we're continually working to improve this process so that we can keep our users safe without having a negative impact on your Messenger service. There are a number of factors that can be used to determine whether a URL is potentially harmful: number of times a URL is sent, the frequency of the URL being sent, the number of accounts the URL is sent from, manually checking the URL, comparing with other "block lists", etc. As always, we're open to feedback on how to make Messenger an even greater service. And again, our apologies to the users that were impacted by this." Upgrade to Windows Live Messenger 8.5 is coming! Posted by sumeethevans on February 20 2008, 9:02 PM. Posted in Messenger. Back in November we shipped the final version of Windows Live Messenger 8.5 along with several other Windows Live applications and services. A lot of you have already upgraded, and for that we thank you and hope you’re enjoying it as much as we enjoyed building it. Starting soon, we’re going to make it easier for those of you who haven’t upgraded yet to get onto our latest and greatest. This will happen in two phases. First, everyone running Windows XP or Windows Vista will get a prompt encouraging you to upgrade. When you accept the upgrade, the new unified installer will launch and start upgrading Messenger. While it’s installing, you’ll have the option to download and install other Windows Live applications. You don’t have to take any of them, but we think you’ll like them and hope you’ll give them a try. It will take a couple of weeks for us to get this upgrade out to all users, so if you don’t get it right away don’t worry, it’s coming. If you don’t want to wait, you can go to http://get.live.com/messenger/overview to download and install Messenger 8.5 right now. After everyone’s gotten the optional upgrade, those of you still running a beta version of Messenger 8.5 will receive a required upgrade to the final version. When this phase kicks in you’ll be blocked from logging in until you complete the upgrade. The final version is even better and more stable than the beta versions, we want you to have the best experience possible! Posted by vasudev on February 15 2008, 9:42 PM. Posted in Messenger. Did you know that MSN messenger recently became the number one instant messenger in the world? Last summer, thanks to the efforts of Helvecio on our team, the MTBot prototype project quietly launched – to provide a glimpse to the community of 28.6 million unique messenger users what might be possible when you combine machine translation technology with instant messaging. The MTBot prototype project was released in May 2007 with the main goal to try to understand how useful machine translation would be in IM conversations. The bot acts as a human translator, participating in conferences and translating messages as they are sent by all parties. A typical usage scenario would be something like this: let's assume you have a friend in Japan that does not speak English... Well, you would add MTBot-en_us@hotmail.com to your Live messenger buddy list, wait until the bot accepts your request (by switching status to Online) and then you would start your conversation by sending the "Hello" message... The Bot is going to wake up, and display a list of languages - enter "ja" for Japanese. Once it gets a valid connection the Bot will tell you to invite your friend to join the conversation. That's it... From this point on, everything you type will be translated from English to Japanese, and everything your friend types will be translated from Japanese to English. Another typical use is as portable translator: using Messenger from any Smartphone a user can translate simple sentences when traveling to other countries. As with any prototype effort, do keep in mind that this is experimental and there is a possibility the bot might be offline from time to time. The usual caveats about the quality of machine translation also apply. We always appreciate your feedback and suggestions – so feel free to do so on this thread. Posted by vasudev on February 6 2008, 11:50 AM. Posted in Messenger. Few days back I had posted here about the 'Fun Family' Pack consisting of 30 Funniest family of cool Emoticons along with many more more emoticons pack for your Windows Live Messenger.